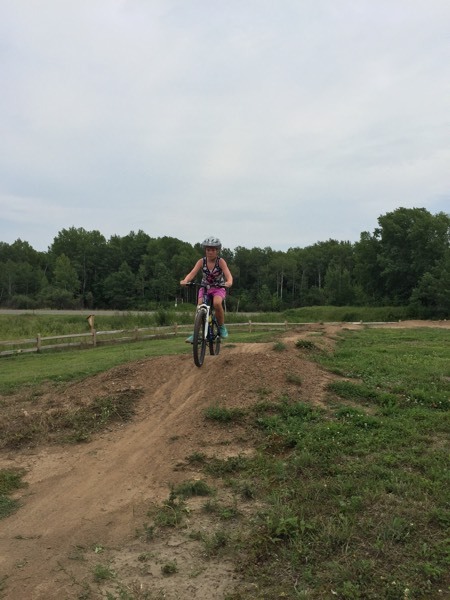 All summer, the girls have been enrolled in a mountain biking class sponsored by our local MTB club and run at the new trails that the club built right in town. 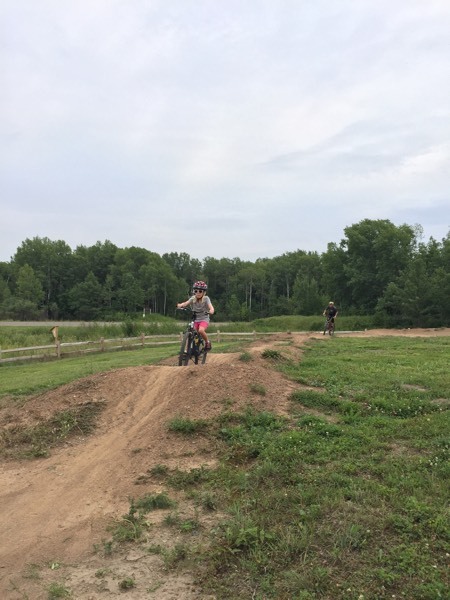 Though I can’t say every class went smoothly or that the girls loved every second they spent in the classes, they did learn a lot about riding and dramatically improved their skills, developed their endurance, and built their confidence. 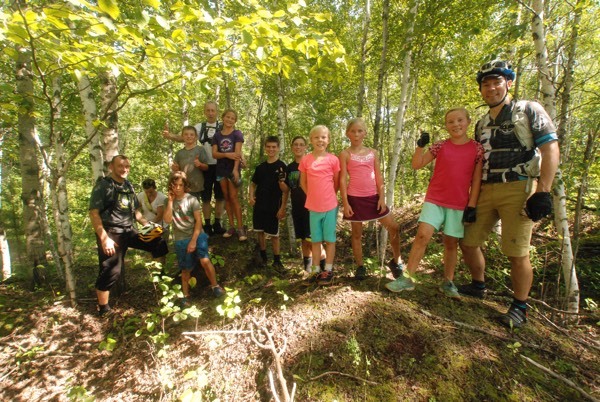 The culmination of the class was an overnight trip to the massive MTB trail system built on abandoned mines at Cuyuna, in central Minnesota. 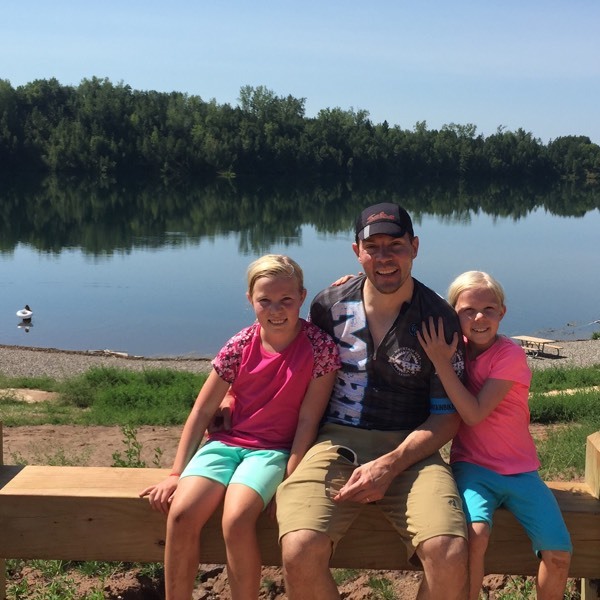 Cuyuna is a fabled place for Minnesota mountain bikers and fatbikers, the place you go for the toughest trails and the best scenery. I had never been up there, so I hoped that the girls would both show the skills to successfully ride there and the enthusiasm to go "up north" on a little adventure. By the middle of July, I could see that they had both: serious abilities on the trails and great eagerness for riding. In addition to the class, we rode several times on our own over the last few weeks, outings which they both loved. And then they crushed some tough challenges at the last regular class, which they described as "the most fun thing ever!" on the ride home. We arrived up north without any problems and almost immediately headed back into town to ride at a "pump track" – a compact system of dirt trails with undulating terrain and banked turns that are laid out so that good riders can get all the way around without pedaling – only "pumping" their arms and legs. None of us could pull off that trick, but everyone had a blast riding around and around and around on the track. I loved watching the girls loving the riding – and rapidly getting better at the unusual techniques needed to conquer the track. Julia crashed once, but was back riding within a few minutes. Whizzing past me, they shouted, "This is so much fun!" After about an hour of pretty continuous riding, we adjourned for ice cream at Dairy Queen. 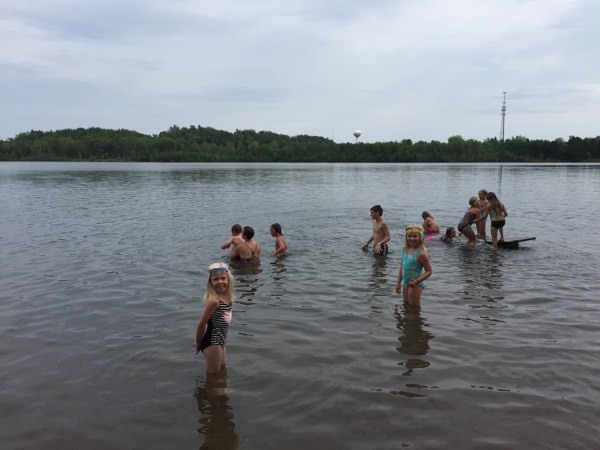 Back at the campground, we set up our tents and took a short out-and-back ride on an easy stretch of the regular trails, getting a little of Cuyuna’s famous red dirt on our tires. then we destroyed a delicious dinner prepared by one of the instructors and his wife – folks who have serious camp-cooking chops! 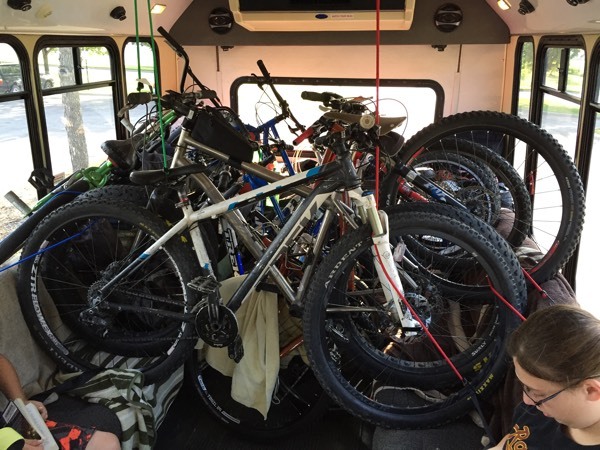 Throughout, I tried to let the girls enjoy themselves and handle things largely on their own, which they readily did: being smart about riding and swimming, choosing good dinners, making their own sleeping arrangements… It was fun to see. Friday morning, everyone woke up eager to hit the trails. 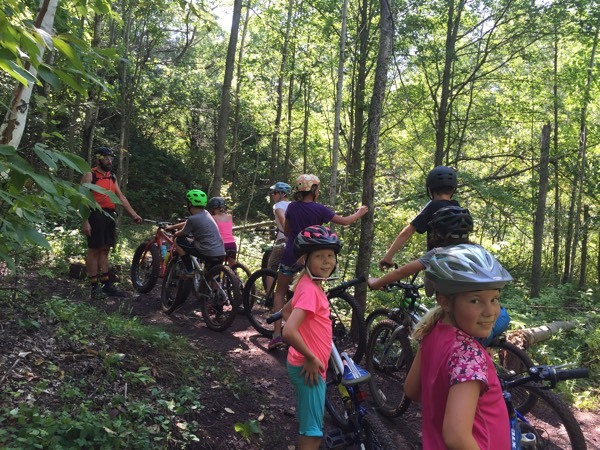 I stayed behind while the other adults went for an early ride on some more challenging trails, but all the kids were great – getting dressed, eating good breakfasts, riding their bikes around excitedly. Finally, around 10, we headed out for a loop that would include three different "easy" trails. The wild card was the weather: as we started, the temps were already near 80° F with very high humidity. I gotta say that I was nervous as hell about whether Julia and Genevieve would be able to ride so much tough trail in such heat and humidity. Wisely, our ride leader stopped often so kids could rest and drink and eat – little pauses that kept everyone energized and focused. Whenever he or the other instructor, riding last in our file, asked if everyone was having fun, the kids shouted, "Yes!" We weren’t even deterred by a few bee stings when we inadvertently posed for a group photo on top of a beehive. Julia got a bad zap on a finger, but soldiered on! I rode as much as I could right behind the girls so that I could watch them buzz along the trails, blonde ponytails poking out from under their helmets. Near the end of the ride, I finally stopped wondering if they could climb that nasty slope, ride that tricky descent, or rail that loose corner. The answer was always "yes," so I just settled in and enjoyed the sight of them loving the sport I love too. The ride ended too soon for me (and I suspect for the other adults), but at just the right time for the kids – 90 minutes and about seven challenging miles of riding. The girls were just tired enough to sit for a nice photo of us – with a loon on the lake in the background! An easy paved ride back to camp brought us down from the high of the ride to our last few activities: a quick lunch, a bit more swimming, and then of course packing up. The bus ride home was sweaty, but pleasingly quiet and relaxed. 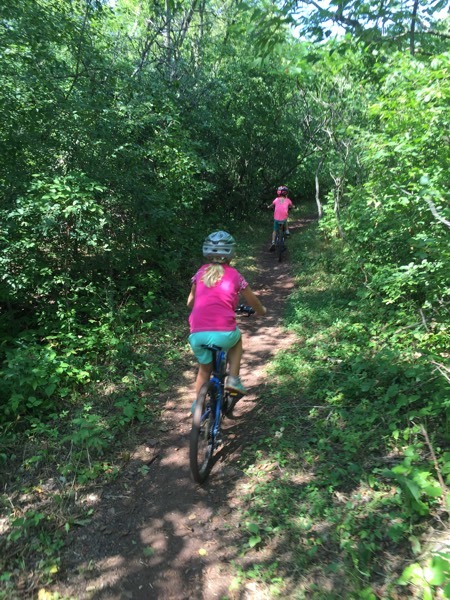 Though we haven’t been back on our bikes since returning, the girls are excited to go to some of the more local MTB trails before school starts, and I am too. I am elated to have them riding the trails with me! Great write-up! Marty looks so small in the background, when we know he’s really a giant. I look forward to having similar experiences in the future. 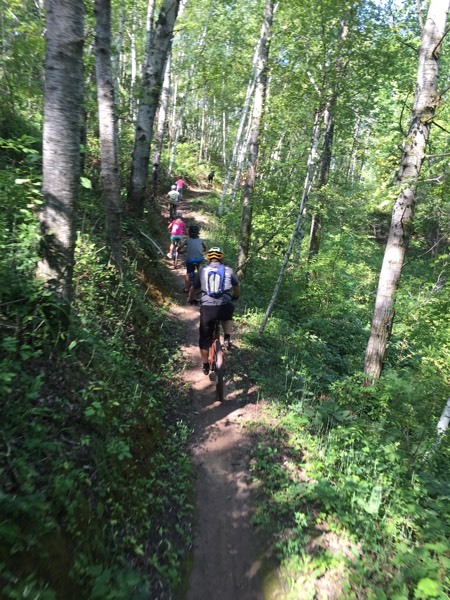 On that note, I didn’t realize anyone else in MN had an MBR jersey (or kit in my case)…. now I don’t feel so unique. Previous Previous post: Vivi Is Nine!